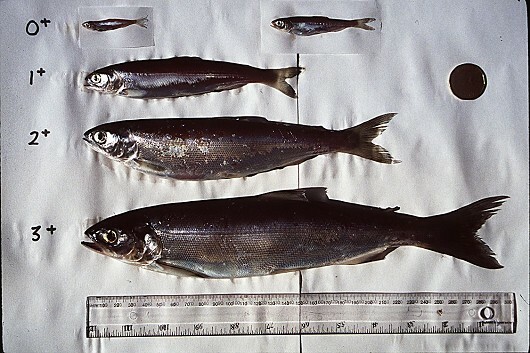 Kokanee is technically a sub-species of the sockeye salmon but its landlocked behavior and development makes it enough of a unique organism to be treated independently. Kokanee are most common in well oxygenated, open waters with temperatures in the range of 10-15°C, normally large lakes and reservoirs. Their diet consists mainly of zooplankton, including copepods and cladocerans, with a preference for a form of cladoceran called Daphnia (water fleas). Small fish and insects are occasionally taken as well. Their diet can change throughout the year and during an individual’s lifetime but this is based upon food availability and not a preference change. The size and age of maturity varies based on environmental factors like food availability, light, and temperature, but also on the population origin of the individual. Depending on where the introduced kokanee came from, life cycles can be as short as 2 years or as long as 7, but most mature in 4 years, including the Lake Tahoe population. This will usually place adults at around 20 cm in length. 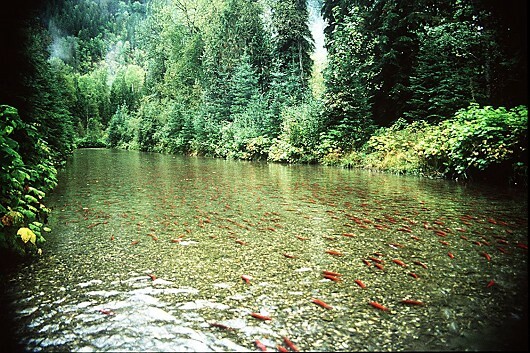 Spawning begins in August and usually runs into early February but kokanee have been found spawning as late as April. Again genetic factors and environmental factors like temperature both play a role in this timing. Regardless of stock, when kokanee are ready to spawn they congregate near the mouths of streams or near lake spawning sites where they were spawned or planted using the smell of the river to home in. Females build redds out of the gravel substrate and both sexes will work to defend the nesting area. The female will then lay as many eggs as she can into the nest followed by at least one male who will then fertilize them. Once fertilized, the eggs are buried by the female beneath 5-15 cm of gravel. Fecundites vary between 200 and 1,800 eggs per female, depending on her size, and it is not uncommon for the female to die before she can release all of her eggs. Most kokanee die 2-4 days after spawning. Depending on when the spawning occurred, fry emerge in April through June and move downstream to mature in lakes. They will reach 10-25 cm TL their first year and 23-47 cm TL in their fourth. The Lake Tahoe population formerly averaged close to the upper edge of these numbers but the introduction of opossum shrimp (Mysis relicta), which competes with kokanee for zooplankton, has reduced food availability and brought kokanee growth rates down.